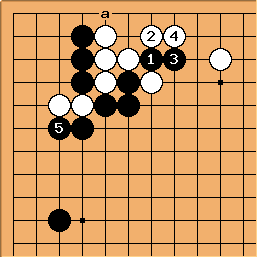 After playing the tsuke-nobi joseki with White pushing into the corner, White may try to push through with . In this position it is an overplay for White to do so. 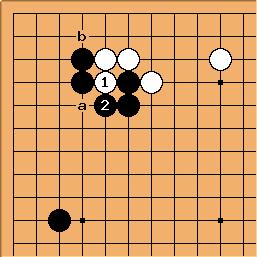 After the - exchange White can either continue with a or with b. 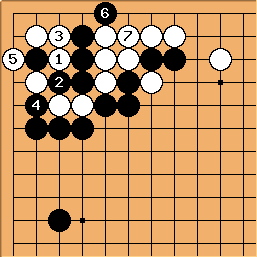 If Black is afraid of the ensuing fight he may be inclined to play along this line. First, playing and allowing White to capture two stones with or a is not good. 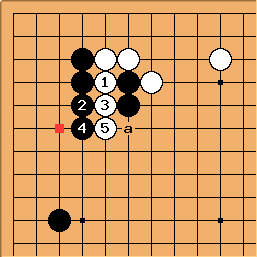 If there is a white stone at the marked spot, this line of play is feasible (see easy way out of a double kakari), but as it is, this give White too much thickness. 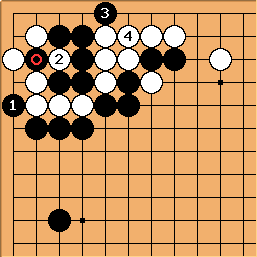 Rather, Black should learn the sequence in the following diagrams, and reveal for what it is: an overplay. Still, in a high-handicap game, Black might play this way, accepting a slight disadvantage for the sake of simplicity. BillSpight: I think it is a disadvantage only by comparison. Let's do a little tewari. Let's pair the and stones. 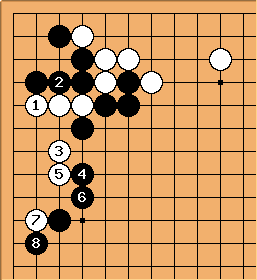 It is perhaps slightly in White's favor to do so, since the black stones have some aji. When White plays , is a key move in this sequence. offers the strongest resistance by filling up a liberty. 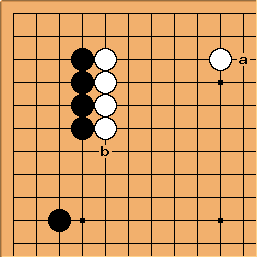 The exact move order is not really important; Black could play before in the previous diagram, or in this diagram he could wait with the - exchange a few moves longer. What is important, is that he does not play the atari at a - he might need it later. here is one possibility, but not White's strongest resistance: we shall see a better move in the next diagram. After , Black, having an eye, will clearly win the capturing race. is a tesuji, making miai of and . 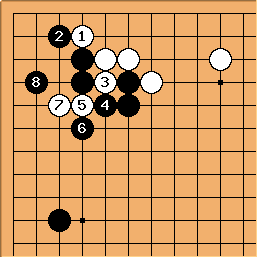 However, is a beautiful counter-tesuji. This move enables him to win the fight in the corner. After the last diagram, the corner is a ko. 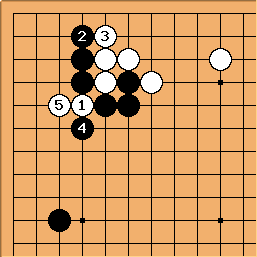 However, Black has carefully kept a ko threat with . 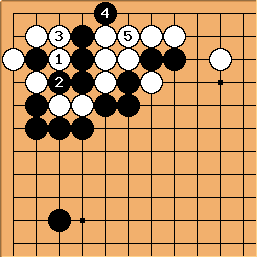 White will not have a ko threat that is good enough, so Black will win the ko and White's moves in this corner are a failure. The move order is important here. Black should not first play atari at here, but play the tesuji of . In this diagram, White wins the ko fight by giving atari from below. Atari from below is no good. If Black plays at , giving atari from below at does not work. 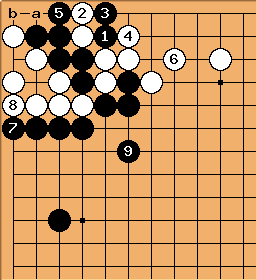 Black now play atari on the two white stones from the other side, and again wins the fight without a ko. BillSpight: Am I missing something here? Doesn't White have a better move at ? White lives in the corner. Not so good, perhaps, but better than the alternative. White has a similar resource in this variation. 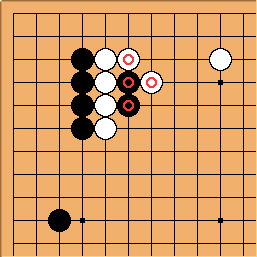 Playing hane at before pushing at is another technique White might try. Like the direct push it is a trick move. is the key point for foiling this trick play. If White continues with , is the simplest answer. 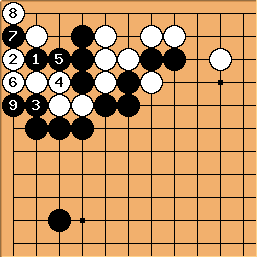 White will be able to live on the side, but Black gains some nice thickness, and his corner is alive as it stands. This is a failure for White. If White turns inwards with , saves the day. The corner is basically seki. 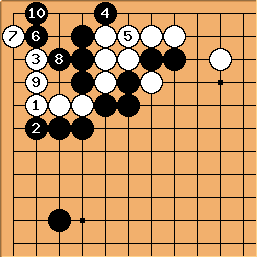 There is a ten thousand year ko left in the corner, but White will not have any chance of winning it after White a. Rather, White should worry about Black starting the ko with b. 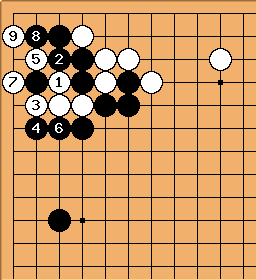 Nevertheless, the (by far) most likely outcome will be that at some point Black plays a or White plays b, turning the position into a real seki. In the meantime, Black has built good thickness.